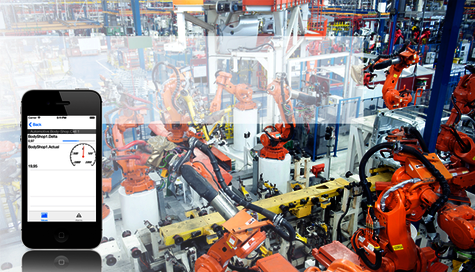 An automobile manufacturer's goal for his production are short cycle times. In order to achieve this it is important to be able to recognize faults at an early stage. With zenon it is possible for faults to be communicated more quickly to neighboring equipment and plant areas. You can initiate the necessary measures early enough in order to avoid lengthy downtimes. One can receive a great deal of diverse information that comes from the production. The different recipients of this data, however, have various requirements for the figures. With zenon the required information level is displayed, complex connections are evaluated in the management cockpit in real-time. The Everywhere App by zenon allows the most important figures to be available at anytime and any place. Important KPIs such as consumption levels, OEE or rejection rates can be monitored via mobile devices such as the Smartphone. This technology is the basis for a reactionary fault management.